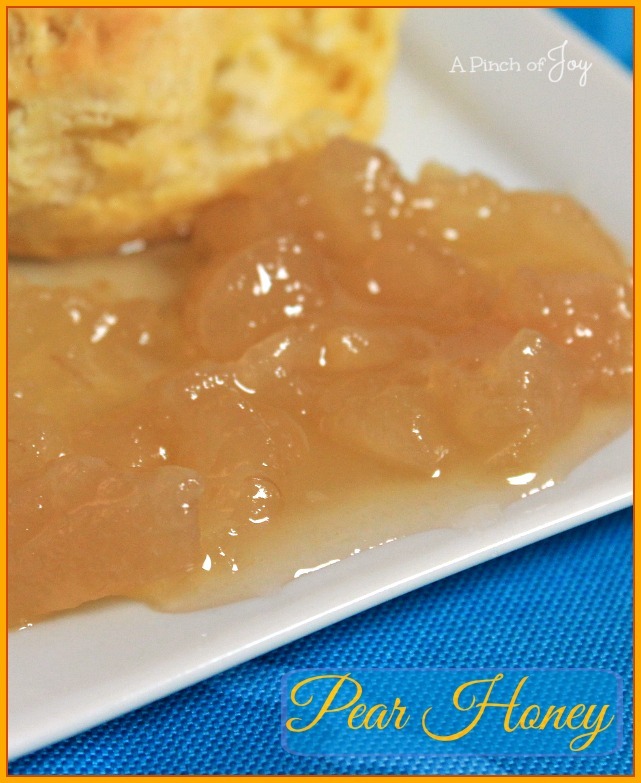 Pear Honey – just what the name says. So sweet and flavorful. Be prepared though. One taste and it will disappear in a flash. See that little bit on the little plate in the picture? That is what is left of the whole batch. Yeh, the same day I made it! A superb spread, Pear Honey is really easy to make. Pear Honey makes me think of turning leaves, earthy smells, and gorgeous rich reds and yellows. It just says Fall! No honey involved and the name may refer to the sweet, deep pear flavor itself. This is a favorite on holiday tables – but you can use it any time! It is a perfectly marvelous topper for ice cream or a crusty bread, hot biscuits or any food you can top with fruit. I use Bartlett pears to make this. They are somewhat thin skinned so peeling is optional. Quarter them lengthwise and remove the core, then cut into small pieces about half inch square. I cut the original recipe in half and just make it when needed and pears are in season in the grocery. If you have access to a pear tree or are able to buy pears in bulk – heaven!! Since the pears are chopped and then cooked, this recipe is a good way to use the seconds. The pear is one of the few fruits that does not ripen on the tree. Harvested when mature, but not yet ripe, then left at room temperature, a pear slowly ripens from the inside out. How do you know when the pear has ripened? The Pear Bureau Northwest says to “ Check the Neck™ daily.” Apply gentle pressure to the neck of the pear with your thumb. If it yields to pressure, it’s ripe.” After it is ripe, put it in the refrigerator to keep up to five days. Pear Honey -- all the goodness of fall in a spoon. 1 Lemon: juice and zest OR substitute 3 tablespoons refrigerated lemon juice. Core and chop pears into smaller than bite size pieces. Measure into large pot. Bring to boil and boil for twenty minutes, stirring occasionally until last five minutes. Stir constantly for the last five minutes as mixture thickens. This will prevent burning and break pears into even smaller pieces. Mixture will turn a light golden brown. Prepare jar lids by placing them in hot water for at least one minute. Fill jars with hot mixture and wipe top lip of jar clean. Put prepared jar lids in place and add loosely tightened rings. Lids seal with a pop as the pears cool. To keep longer without refrigeration, process for 10 minutes in boiling hot water bath, let set in hot water for another five minutes before removing jars to cool. Do not store any jars on which the lids did not seal. Refrigerate those and use within three months. Processed jars that have sealed will keep up to a year as long as the seal is not broken. I was thinking these would be great on toast until I was the biscuit idea. It would also be yummy on cornbread! Oh — I didn’t think about cornbread! That would be good!!! . Just printed this off! My hubby is going to be so excited about this!!! Enjoy!! You know, making this MIGHT lead to making fresh biscuits or home made bread, too 🙂 Distract him with a bowl of vanilla ice cream with a spoonful of Pear Honey on top.